There's more info on our other 3 websites,too! 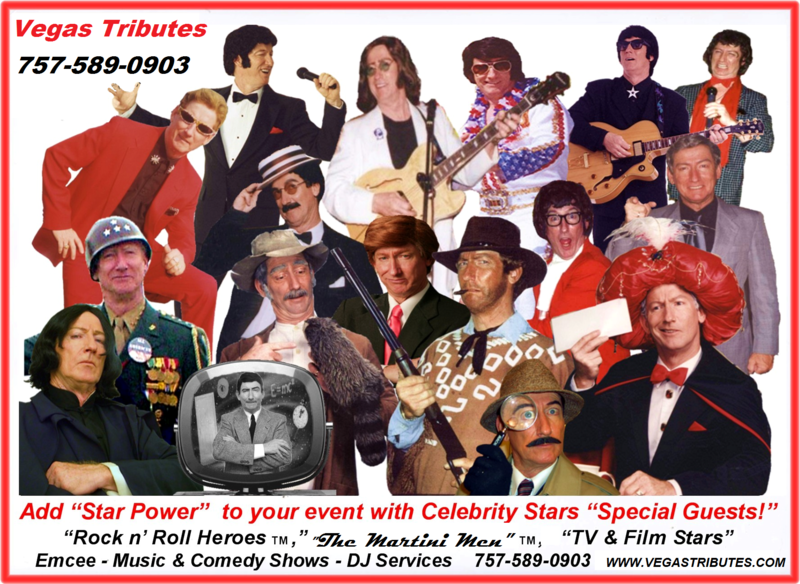 Vegas Tributes TM is the professional name and collective 32+ years career of Tim Beasley, a professional licensed and insured variety entertainer, emcee, actor of stage, on-camera for TV and Film and Voice-Over actor for entertainment productions of all manner... This web site shows a wide variety of these roles, some more unique than you'd expect! Use the easy "navigator tabs" at the top of this home page to see the individual web pages of all Tim's performances by clicking on the "Stars List" tab...Enjoy the tour!!! Entertainment and musical superstars like Dean Martin, Frank Sinatra, Tony Bennett, Bobby Darin, Paul Anka, Neil Diamond, Tom Jones, Billy Joel, Rod Stewart, Andy Williams and Elvis made Las Vegas the exciting center of the live entertainment world, one great night at a time. The glamour, glitter and golden glow of Las Vegas' bright lights, hot nights and entertainer superstars has attracted many millions to come and enjoy a time they'll never forget! There have been the very best entertainers in show business wowing the crowds of good time party people in the legendary casinos of yesterday and the huge casino resorts of today, and that history and heritage makes all of those great performers Las Vegas "Royalty!" HERE'S SOME GRAND ENTERTAINMENT OFFERINGS! "TAXMAN DAY JOHN LENNON" SHOW FOR APRIL 15, MEMORIAL DAY WITH "GENERAL PATTON," JULY 4TH "BEACH BOY MIKE" SHOWS, LOTS OF "FUN-FUN- FUN" FOR SPRING & SUMMER! ...WE HAVE GREAT SHOWS FOR GREAT OCCASIONS!!!! Just imagine how impressed your guests will be if any of these Superstars of the Vegas Strip were to join you at your event, anywhere in the US, Canada, Caribbean, Bermuda, UK and Europe! Well, that's "almost" possible with Vegas Tributes TM....in this sense, we bring Las Vegas to you! Here's a version of our popular Triple-Superstars shows known professionally as "The Martini Men" TM that are always winners! "The Martini Men - Las Vegas Live!" TM featuring "Neil Diamond," "Tom Jones," "Rod Stewart" and also as alternates in a 3 Superstar line-up, "Billy Joel" and "Bob Seger" reflects the grand 70's - 80's era of the Vegas Strip, and the monster string of hits each had during their top of the marquee years in Vegas...as "living legends, this terrific trio of the real fellows does return to sold out crowds in the largest showrooms. You can generate the same kind of "oh yeah!" factor for your events, like the ever-popular "Casino Nights" for fund raisers and other special events. Either as one, or all three, our "Martini Men" bring a big bang to your audience! Vegas Tributes TM , a division of TBC STARS Entertainment, is a national production company specializing in variety professional celebrity impersonations - tributes, as it's known in the media, with recreated performances of these superstars for corporate special events, casinos, resorts, theaters and festival stages, conventions and private celebrations, too! Not only with stars from music and comedy, but also including unique TV and film (The Godfather, Gomez Addams, Clint Eastwood, Humphtey Bogart, Groucho Marx and more! ), history (Abe Lincoln, Ronald Reagan, General Patton, yes, and more! ), sports (Richard Petty, Dale Ernhardt Sr.), and literary celebrities (Edgar Allan Poe, Mark Twain, Sherlock Holmes...more!!!). Vegas Tributes' wide variety of popular music and comedy tribute shows are exactly that, a tribute and homage to those great stars. To create these exciting fully dimensional and complete impersonation performances of voice, manners, actions and looks takes countless hours of dedicated study, rehearsal, practice, authentic costumes and make-up wizardry. As you'll find in the show highlights, we bring many of your favorite stars from today and yesterday to your event stage in as perfect an impersonation as possible. We've been at this truly unique form of entertainment for over 25 years, as featured acts, headliners, emcees and guest speakers and have entertained countless thousands, if not millions, in that time. This web site presents some of our most requested performance recreations of legendary and live performers and we offer Las Vegas-style entertainment coast to coast and internationally for your special event or venue. Please take the tour. We think you'll find there are many great ideas for having our Vegas Tributes join you for entertaining your guests! Pictured below are marquees for several more of our exciting one-man, multi-star shows. 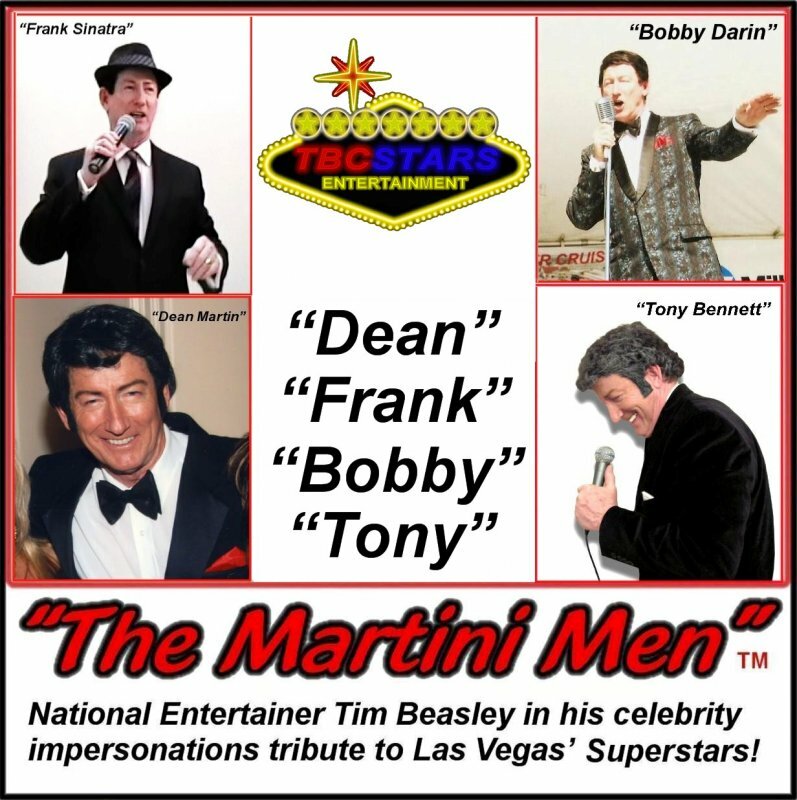 "The Martini Men - Classic Vegas Vibe" is always a classy fun booze-schmooze specialty show, here showing another four of them, "Frank Sinatra, Dean Martin, Bobby Darin and Tony Bennett. 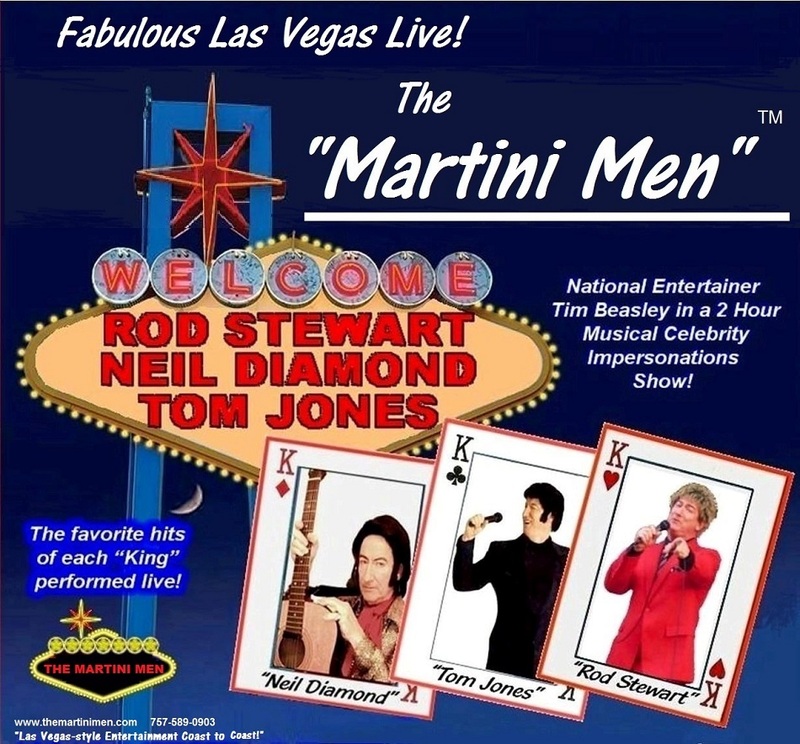 "...and there are also two other "honorary Martini Men" in the Vegas Tributes as alternates in this line up, "Andy Williams" and "Paul Anka" . . .as we said, there's many entertaining possibilities! "Country Superstars" combines the fun and charm of country music and comedy together in a truckload of good times for company picnics, corporate "hoe downs" and any "blue jean" style event. 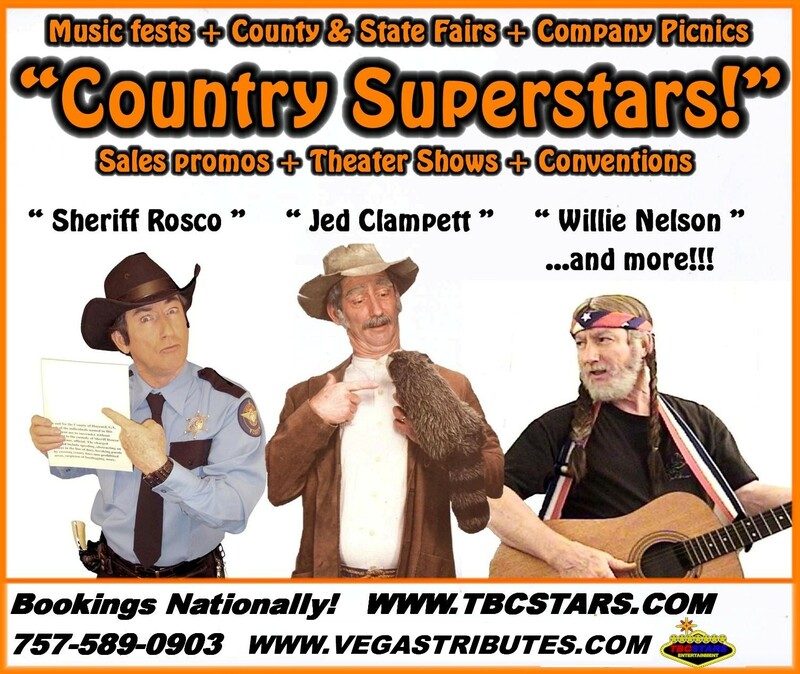 Featuring the comedy antics of TV's "Dukes of Hazzard," Hazzard County's comedically corrupt sheriff, "Sheriff Rosco," he's great for issuing tickets and citations for lots of laughs! Our "Jed Clampett" leads the way from Beverly Hills to show his audiences some good ole "Clampett- stomp" line dance moves and family new funnies, and "Willie Nelson" rounds 'em up for some great honky tonkin' "Yeee-Haw" tunes! "Rock n' Roll Heroes" is a great show for fans of classic rockers that include the triple superstar line-up pictured above, as "Buddy Holly," "Roy Orbison, "John Lennon" and optionally in a mix and match of your choice with "Jerry Lee Lewis," "Jim Morrison," "Beach Boy Mike Love" and of course, "Elvis Presley!" 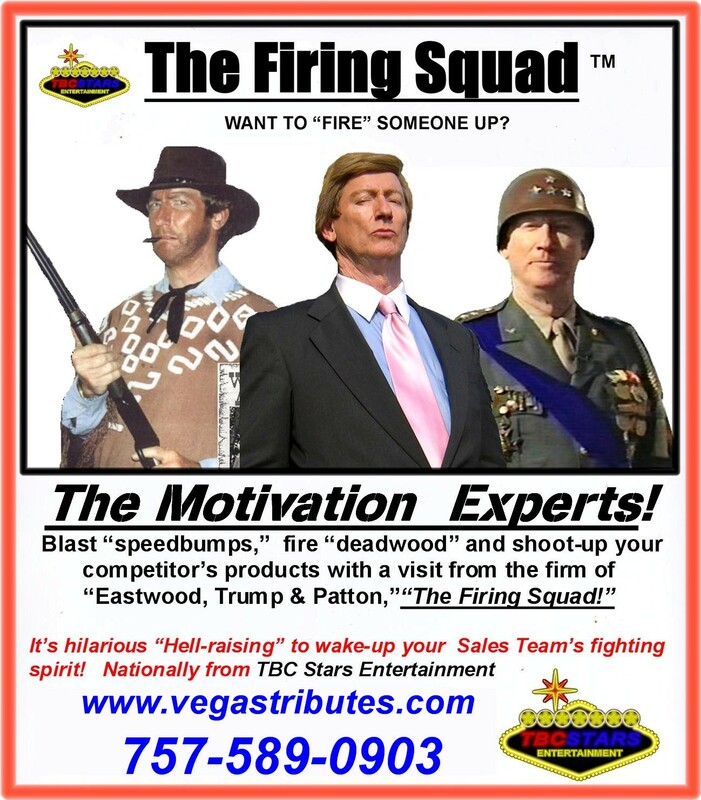 "The Firing Squad" packs a lot of fun into any motivational meeting, or as a wild and crazy roast for any retiree - promotion parties, as they will definitely light a fire under the behind of anybody you choose! Hilarious Hell-raising, guaranteed!!! As live performances, every celebrity we recreate adds a grand dimension of fun, excitement and glamour to any event...It's Vegas Tributes for entertaining you and your guests! OFFERINGS...WE HAVE GREAT SHOWS FOR GREAT OCCASIONS!!!! Looking forward to your replies, inquiries, questions, and bookings. celebrity, impersonator, tribute, show, entertainment, look alike, sound alike, impressionist, stand-in, actor, comedian, live stage, theater, TV, Radio, Film, movies, stars, Hollywood, Las Vegas, Paris, Miami, Atlanta, Chicago, LA, Palm Springs, New York City, Lake Tahow, Reno, Nassau, London, Toronto, British Columbia, Seattle, Dallas, emcee, host, corporate, convention, convention center, trade show, reunion, casino, cruises, country clubs, resort, hotel, hospitality.